Some questions in a story at Aurora Universe. I have some questions in a story I read in the Aurora Universe. 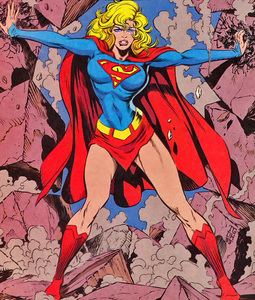 It is under Book 5: A Dark Supergirl arises. In chapter 8 where Jim accompanied Sharon to loo for two Kintzi. What happened to Jim after the blast from the Arion ship? Did he survive? I can't read what happened to Jim in the succeeding chapters. Hope someone can please tell me. Thank you. Replied by shadar on topic Some questions in a story at Aurora Universe. Unfortunately, Jim Johnson of the LAPD, one of Sharon's old friends, is one of the characters (and a good one) who I lost track of when we were writing that series. Several authors were writing the series at that time, but Jim (who had some exotic armor and armed with stolen Arion weapons) was supposed to be significant. He was my character and I dropped him from the narrative as the series continued. I wrote that series when I was living in LA, and Jim was a real person and a friend of mine and a member of the LAPD. Officer Jim Johnson (changed last name) in the story was my attempt to capture the best of the really decent people I'd met in LA, and Jim was was a great person to model a character on. I don't remember why I dropped his character from the narrative (that was back in the mid-90's, so my memory is foggy). Of course, I've now put this on my list of things to fix as I rewrite the Dark Supergirl series, and when I publish the 21st century version of that series, Jim will continue to have a prominent role. I've delayed long enough in starting to republish this series, so I'm going to post the first two parts today. I wanted to include the third part in this first posting, which is very ubergirl-action driven, but that part has so many problems with changing POV characters that I'm still trying to fix it. Part 1 and 2 set the stage and will reintroduce you to Sharon Best, a Scribe of Velor and Deb, her partner, along with a handful of the people in their lives. And of course we meet Mandi Olson, my first real take at an Ubergirl, a villain who is nearly unstoppable after her empowerment. Mandi quickly proves in Part 2 that she has no qualms in killing humans. She's an enemy alien, an Arion born and raised, and who like all Arions has very little respect for Frails (as they call humans). Replied by ong76win2 on topic Some questions in a story at Aurora Universe. shadar wrote: Unfortunately, Jim Johnson of the LAPD, one of Sharon's old friends, is one of the characters (and a good one) who I lost track of when we were writing that series. Several authors were writing the series at that time, but Jim (who had some exotic armor and armed with stolen Arion weapons) was supposed to be significant. He was my character and I dropped him from the narrative as the series continued. Thanks for replying Shadar. Finally got the time to read your work yesterday and I noticed regarding Jim. I did ask these questions to fats but he doesn't know and he also suggested to post my questions in the forums. Thanks to fats for the suggestion. I also almost forgot about you that you are the author of Aurora Universe. By the way, where can I find your re-writes? Where will you post them? Thank you. I'm posting the first three parts (decided part 3 was good enough) of the series now. There are a total of 39 parts, so its the size of a large novel. I'll keep posting them as fast as I can update them. Another question shadar. What happened to the new friend of Jenna (I forgot his name) where Jenna saved him from falling from the second floor of his house and where a battle took place at Sharon's house? ong76win2 wrote: Another question shadar. What happened to the new friend of Jenna (I forgot his name) where Jenna saved him from falling from the second floor of his house and where a battle took place at Sharon's house? My problem here is that I don't remember most of this... its been a decade since I looked at this story and nearly two decades since I started writing it. I'm going to have to re-discover a lot of things as I go through, and Jenna is now added to my list of potential loose ends to keep in mind as I do that. I will say that I really enjoyed resurrecting the first three parts and adding and fixing things as I went. I'd forgotten how involved and dramatic the original story was. Goal is to keep the essence and plot and good stuff and fix the stuff that didn't work or is too far from my current concept of the genre. Hopefully that will make it more dramatic and exciting as I go, but its always tricky to remaster something that's two decades old. Fortunately, my imagination hasn't faded, although its changed a little (only my energy level has truly faded). I have three parallel projects... finishing the Supergirl/Maxima story and redoing and then continuing the First Protector story line with Brantley. Also have one other AU story called Skin Walkers that I'm enjoying writing. So I guess that makes four. I'll post where I am on Skin Walkers in a few minutes so you can get an idea where its going and get some feedback to decide if its worth continuing. Its classic AU stuff, but entirely new writing that I started this month, and it features someone who isn't human or Velorian or anything remotely close. A shape changer, or Skin Walker as the native North Americans used to call them. They are also the basis for werewolves and vampires of legend. They can take on the form and abilities of anyone whose DNA they have tasted (which in my universe, accounts for the various vampire rumors in literature). Lots of possibilities once I get her on Earth.